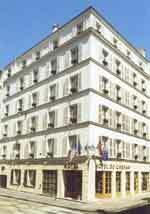 Our boutique hotel, Hotel du Cadran, invites you to discover a quite special «Paris village» in the heart of one of the most prestigious district of the Capital. Ideally located, two steps away from the Eiffel Tower, the Invalides, the Rodin Museum, the Orsay Museum and 20 minutes away from the Champs-Elysées, le Cadran is very pleased to welcome you and be your special guide around an authentic Paris. The elegance of the neighbourhood has for centre point “la rue Clerc” a market street, opened every day, where you will discover a wonderful variety of French delicatessen and patisseries. Its cafés and restaurants will give you a real taste of our French lifestyle! Whether you are travelling for leisure or business, you will appreciate the quality of our services; and especially the help of our professional front desk staff who will guide you towards our Parisian addresses and help make your stay unforgettable! The nearest station is Montparnasse. Take bus line 92 and alight at Académie Militaire. Bus: lines, 92, 80 and 28 stop at Académie Militaire. Metro: line 8 stops at Académie Militaire. RER C: alight at Pont de l'ALMA. RER B: alight at Denfert-Rochereau.